Para el músico canadiense (1949- ), véase David Foster. Doce de las entrevistas en Entrevistas breves con hombres repulsivos fueron adaptadas en una obra de teatro en el año 2000, Hideous Men, adaptada y dirigida por Dylan McCullough, que se estrenó en el "New York International Fringe Festival" en agosto de 2000. Conversaciones con David Foster Wallace, editorial Pálido Fuego, 2012. Benzon, Kiki. "Darkness Legible, Unquiet Lines: Mood Disorders in the Fiction of David Foster Wallace." Creativity, Madness and Civilization. Ed. Richard Pine. Cambridge: Cambridge Scholars Press, 2007: 187–198. Burn, Stephen. "Generational Succession and a Source for the Title of David Foster Wallace's The Broom of the System." Notes on Contemporary Literature 33.2 (2003), 9–11. Cioffi, Frank Louis. "An Anguish Becomes Thing: Narrative as Performance in David Foster Wallace's Infinite Jest." Narrative 8.2 (2000), 161–181. Delfino, Andrew Steven. "Becoming the New Man in Post-Postmodernist Fiction: Portrayals of Masculinities in David Foster Wallace's Infinite Jest and Chuck Palahniuk's Fight Club. MA Thesis, Georgia State University. Goerlandt, Iannis. "Fußnoten und Performativität bei David Foster Wallace. Fallstudien." Am Rande bemerkt. Anmerkungspraktiken in literarischen Texten. Ed. Bernhard Metz & Sabine Zubarik. Berlin: Kulturverlag Kadmos, 2008: 387–408. Goerlandt, Iannis. "'Put the book down and slowly walk away': Irony and David Foster Wallace's Infinite Jest." Critique: Studies in Contemporary Fiction 47.3 (2006), 309–328. Goerlandt, Iannis. "'Still steaming as its many arms extended': Pain in David Foster Wallace's Incarnations of Burned Children." Sprachkunst 37.2 (2006), 297–308. Holland, Mary K. "'The Art's Heart's Purpose': Braving the Narcissistic Loop of David Foster Wallace's Infinite Jest." Critique: Studies in Contemporary Fiction 47.3 (2006), 218–242. Jacobs, Timothy. "The Brothers Incandenza: Translating Ideology in Fyodor Dostoevsky's The Brothers Karamazov and David Foster Wallace's Infinite Jest." Contemporary Literary Criticism Vol. 271. Ed. Jeffrey Hunter. New York: Gale, 2009. LeClair, Tom. "The Prodigious Fiction of Richard Powers, William T. Vollmann, and David Foster Wallace." Critique: Studies in Contemporary Fiction 38.1 (1996), 12–37. Nichols, Catherine. "Dialogizing Postmodern Carnival: David Foster Wallace's Infinite Jest." Critique: Studies in Contemporary Fiction 43.1 (2001), 3–16. Tysdal, Dan. "Inarticulation and the Figure of Enjoyment: Raymond Carver's Minimalism Meets David Foster Wallace's 'A Radically Condensed History of Postindustrial Life.'" Wascana Review of Contemporary Poetry and Short Fiction 38.1 (2003), 66–83. ↑ a b c d e f Lopate, Leonard (entrevistador) (4 de marzo de 1996). «David Foster Wallace (entrevista radiofónica)». The Leonard Lopate Show. WNYC. Consultado el 14 de septiembre de 2011. ↑ Lipsky, David. Although of Course You End Up Becoming Yourself: A Road Trip with David Foster Wallace. New York: Broadway, 2010. ↑ «Interviews – Neal Stephenson – Powell's Books». Powells.com. 16 de febrero de 2011. Consultado el 26 de febrero de 2011. ↑ a b «Writer David Foster Wallace found dead». The Los Angeles Times, Claire Noland and Joel Rubin, September 14, 2008. ↑ «Writer David Foster Wallace Dies». The Wall Street Journal, AP, 14 sep 2008. Archivado desde el original el 17 de septiembre de 2008. ↑ a b "David Foster Wallace, Influential Writer, Dies at 46", The New York Times, 14 de septiembre de 2008. ↑ Ryerson, James (14 de diciembre de 2008). «Consider the Philosopher». The New York Times. Consultado el 2 de abril de 2010. ↑ «Our Alumni, Amherst College». Cms.amherst.edu. 17 de noviembre de 2007. Consultado el 26 de febrero de 2011. ↑ «In Memoriam: David Foster Wallace '85, Amherst College». Amherst.edu. 14 de septiembre de 2008. Consultado el 26 de febrero de 2011. ↑ "David Foster Wallace Biography". ↑ «Wittgenstein Is Dead and Living in Ohio». The New York Times. Consultado el 2 de abril de 2010. ↑ Carlson, Scott (14 de septiembre de 2008). «David Foster Wallace, Postmodern Novelist and Writing Teacher, Is Dead at 46». Chronicle of Higher Education. Consultado el 30 de mayo de 2010. ↑ a b c «David Foster Wallace, Influential Writer, Dies at 46». The New York Times, Bruce Weber, September 14, 2008. 15 de septiembre de 2008. Consultado el 2 de abril de 2010. ↑ a b Lipsky, Dave (30 de octubre de 2008, Edición 1064). «The Lost Years & Last Days of David Foster Wallace». Rolling Stone. ↑ «Jonathan Franzen Remembers David Foster Wallace». The Observer, Adam Begley, 27 de octubre de 2008. Archivado desde el original el 30 de octubre de 2008. ↑ «Lee, Chris. "John Krasinski, 'Brief Interviews With Hideous Men'" Los Angeles Times, 19 de enero de 2009». Los Angeles Times. 19 de enero de 2009. Consultado el 26 de febrero de 2011. ↑ «John Krasinski Conducts Brief Interviews With Hideous Men». TotalFILM.com, 19 de septiembre de 2006. Archivado desde el original el 25 de julio de 2008. ↑ «Tri-Stan». Eric Moe. Consultado el 26 de febrero de 2011. ↑ Midgette, Anne (2 de abril de 2005). «A Menu of Familiar Signposts and a One-Woman Opera». The New York Times. Consultado el 2 de abril de 2010. 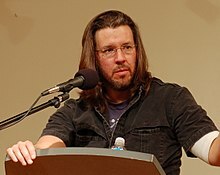 Esta obra contiene una traducción derivada de David Foster Wallace de Wikipedia en inglés, publicada por sus editores bajo la Licencia de documentación libre de GNU y la Licencia Creative Commons Atribución-CompartirIgual 3.0 Unported.